The 2017 program exploration program at the Pyramid Property consisted of reverse circulation drilling and diamond drilling. Drilling in 2017 tested 4 zones throughout the northern portion of the Pyramid Property. Drilling encountered encouraging mineralization at both the West and East Zones. Two RC holes were drilled in the East Zone to cross cut surface rock sampling up to 11.6 g/t Au. Drill holes PY-17-04 and PY-17-05 both encountered Argillic (Clay-Pyrite) alteration as well as QSP alteration. The results are summarized below in Table 1. This drilling confirms the presence of wide spread gold ± copper mineralization. The most significant intercept were 28.95m of 0.28 g/t Au in hole PY-17-04, which included 4.57m of 1.43 g/t Au and 91.44m of 0.12 g/t Au which included 4.57m of 0.94 g/t from shallow depths in PY-17-05. The West Zone which was RC drilled in 2016 was further tested with RC and diamond drill holes in 2017. Drilling encountered three styles of mineralization there: epithermal gold hosted by quartz-carbonate-chlorite (±hematite) veins, the stronger porphyry event encountered at the south west of the West Zone (PY-16-01, PY-17-09, and PD-17-03), as well as the background early porphyry Cu-Au event. PY-17-08 was drilled to intersect anomalous copper and gold surface rock and soil geochemistry as well as targeting an area of moderate chargeability between two chargeability high’s. This hole encountered 6.62m of 0.25 g/t Au. PY-17-09 was drilled into a 500m wide shallow chargeability high in the western portion of the West Zone. It returned encouraging copper mineralization with 21.32m of 0.09% Cu from 67.06m including 9.14m of 0.13% Cu. Chip logging determined the presence of strong QSP alteration within the drill hole. Three holes, totaling 1,384 meters were diamond drilled, with two holes targeting the West Zone and one hole targeting the Central Zone. ” Drill hole PD-17-03 (390m) drilled 800m from 17-02 returned 26m of 0.40 g/t Au Eq (111-137m). Drill holes PD-17-02 and PD-17-03 were drilled 800m apart on the West Zone target and tested shallow to deep IP chargeability anomalies coincident with anomalous gold-copper soil and rock geochemistry. Drill hole PD-17-02 (485m) returned 481.5m of 0.19 g/t Au Eq (0.16 g/t Au) including 19.2m of 0.60 g/t Au Eq (0.57 g/t Au) from 101m and 75.0m of 0.35 g/t Au Eq (0.32 g/t Au) from 278m. The hole is located 3.7km from Highway 37 and was collared to target highly anomalous copper and gold soil and rock geochemistry with a coincident IP chargeability anomaly. Drilling encountered anomalous background copper mineralization throughout the hole indicating the upper levels of a porphyry environment. Epithermal style gold and silver bearing quartz carbonate chlorite (hematite) veining overprints earlier porphyry alteration. Mineralization consists of fine grained disseminated pyrite in addition to occasional occurrences of visible gold. Mineralization is open in all directions and at depth. Drill hole PD-17-03 (390m) collared above a chargeability high with coincident anomalous gold-copper soil geochemistry. It was drilled 73m to the south of RC drill hole PY-17-09 which encountered 9.14m of 0.13% Cu. Diamond drilling returned 26m of 0.40 g/t Au Eq (0.29 g/t Au) from 111m. + – True widths are unknown at this time, intervals reported represent core lengths. The East Zone also produced encouraging results with the two widely spaced (~1km) holes both returning anomalous gold and copper grades. Given the spacing of the drill holes and the amount of talus cover in the basins, this target is still poorly understood. The Central Zone was also tested with targets being selected based upon 3D chargeability and resistivity in addition to soil samples. Drilling encountered predominantly propylitically altered rocks with weakly anomalous copper mineralization. Drill hole PD-17-01 (509m) was completed in the covered Central Zone. Earlier reverse circulation drilling on the target (NR dated Aug 14th, 2017) encountered zones of strong phyllic alteration within diorites. PD-17-01 drilled through diorites with anomalous background copper geochemistry and into andesites. The hole failed to return any significant intercepts; however, epithermal style alteration was present throughout the hole. Given the large size of the West Zone target, the first two diamond drill holes, 800m apart, have only begun to test the mineralizing system and the Company would like to aggressively follow up on West Zone in 2018. Original interpretations have led OK2 and our consultants to believe that mineralization was predominantly related to a porphyry event but given the widespread gold mineralization, the prospect has the potential to host a large bulk tonnage epithermal gold system and a gold-copper porphyry. The East Zone also produced encouraging results with the two widely spaced (~1km) holes both returning anomalous gold and copper grades. Given the spacing of the drill holes and the amount of talus cover in the basins, this target is still poorly understood and remains essentially untested. The 2016 program exploration program at the Pyramid Property consisted of geological and alteration mapping on the West and East Zones which revealed zoned alteration typical of porphyry copper-gold and epithermal gold deposits respectively. 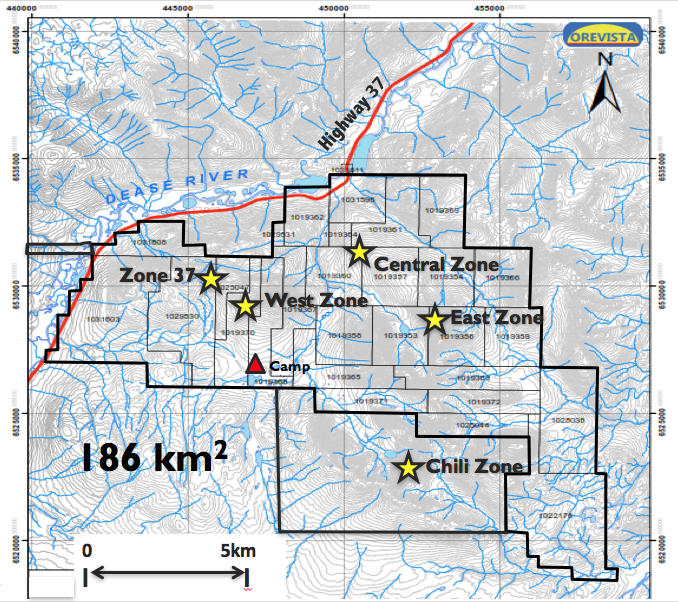 Regional work led to the discovery of two new zones: the Chili Zone in the SE portion of the property and Zone 37, located adjacent to the West Zone. Zone 37 is located 2.5km southeast of Highway 37 and is adjacent to the West Zone. It includes an area with Brucejack-style epithermal expressions, including quartz stockworks and quartz blow outs. The zone is defined by rock samples grading from background to 83 g/t Au (2.67 oz/ton) and 0.47% Cu from a narrow quartz-carbonate-chlorite vein. Chili Zone encompasses a 15km2 alteration assemblage located 5-10km along trend to the southeast from the West Zone. Discovery of this zone required the company to expand our land position considerably as reported in the news release dated Sept 20, 2016. The zone contains rock samples with disseminated mineralization grading from background to 0.15% Cu and background to 0.18 g/t Au. Within this zone is a large, high level alteration zone with up to 10% disseminated pyrite with intense silica and sericite development. This zone remains relatively unexplored and will be followed up with a soil geochemical, IP geophysical survey, and detailed mapping in future exploration programs. 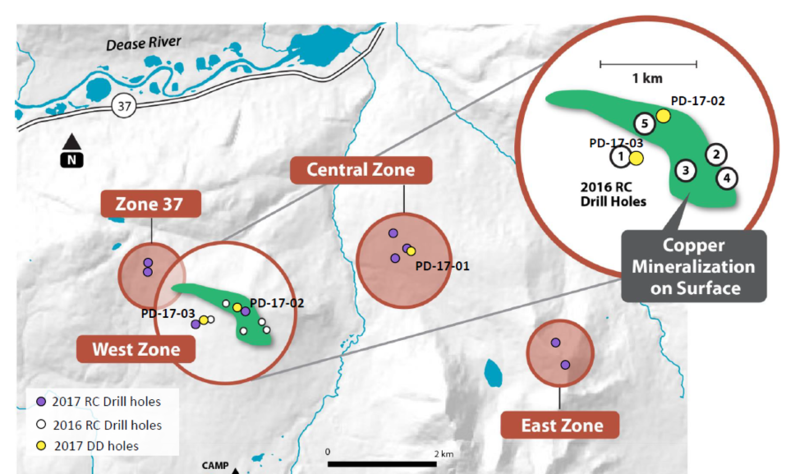 The Company has commenced a 5-10 hole, reverse circulation (RC) drill program on the West Zone. The helicopter supported RC rig has capabilities of reaching 200m depth and will be used primarily as a reconnaissance drill that will help prioritize areas for subsequent diamond drilling. To date, four holes have been completed with the fifth hole currently in progress. The early onset of winter conditions has slowed the progress of the drilling. Upon conclusion of the RC drilling program, all samples will be shipped to SGS Labs in Vancouver for analysis. The building of a fly camp located 2km south of the MT zone.